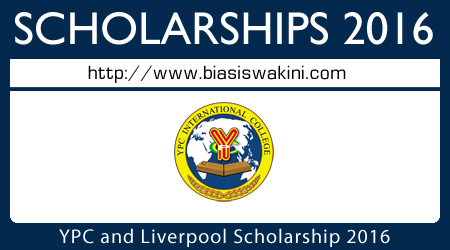 YPC-Liverpool Scholarship is a special scholarship 2016 for Malaysian students who want to further their study at YPC International College. This Scholarship covers the tuition fees in full and only available for Foundation in Business(FBZ) and Foundation in Business and Information Technology(FBI). Upon completing the Foundation programme, students will continue with a Degree programme of their choice, in collaboration with Liverpool John Moores University, U.K. at YPC International College, Malaysia or at Liverpool John Moores University, U.K. SPM leavers with a minimum of 5 credits are encouraged to apply. 0 Komentar untuk "YPC-Liverpool Scholarship 2016 For Malaysian Only"